Off to a family wedding today. Best wishes and long happy life to Áine and Conor. A busy week coming to an end. Madness! From Wexford to Derry. Cork to Dundalk. Leinster House to Stormont. And all places in between. Wednesday in Derry was a good day for the Irish language. At the launch of the An Ciste Infheistíochta Gaeilge this blog reflected on the Hillsborough talks last January. The peace process was in another crisis. The DUP was refusing to move on the transfer of policing and justice powers and the two governments and all of the parties ended up in Hillsborough Castle in an effort to find a resolution. It was eventually achieved, at the end of a long and difficult negotiation, as a result of direct face to face talks between the Sinn Féin team and the DUP. At the outset of the talks Sinn Féin put Acht na Gaeilge, an Irish language strategy for the north, and the 1737 Administration of Justice Act, which bans the use of Irish in the courts, on the agenda. The British government was not interested. It wanted the focus to stay entirely on policing and justice and the parading issue. This blog disagreed. 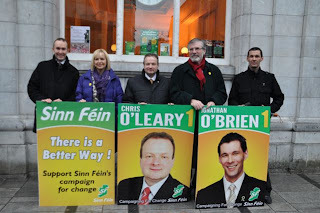 The Irish government also resisted having the Irish language on the agenda. Neither, the Taoiseach or the British Prime Minister made any mention of the rights of Irish speakers or of the language when they came to Hillsborough or when they left the talks two nights and three days later. The Taoiseach did raise the issue eventually but that was only after Martin McGuinness and I had a blazing row with him and forcefully challenged Mr. Cowen and Gordon Brown. 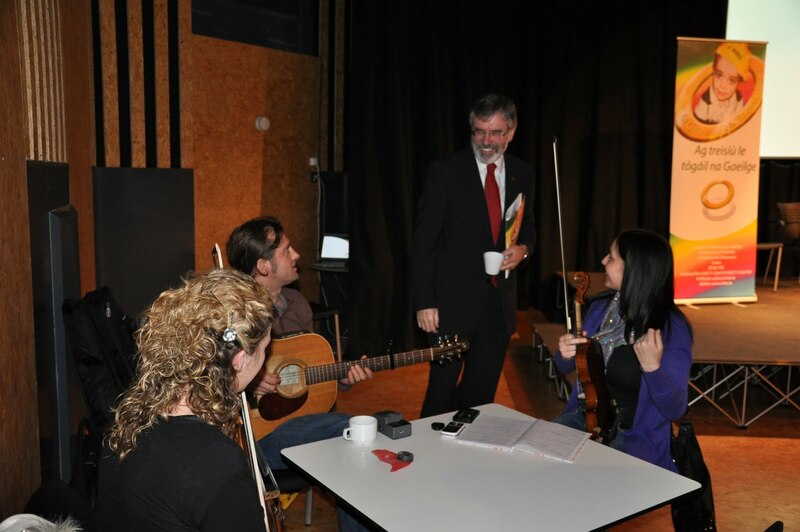 Some progress was made in separate discussions with the DUP Minister for Culture, Arts and Leisure, Nelson McCausland, who agreed to bring forward a strategy on the Irish language. 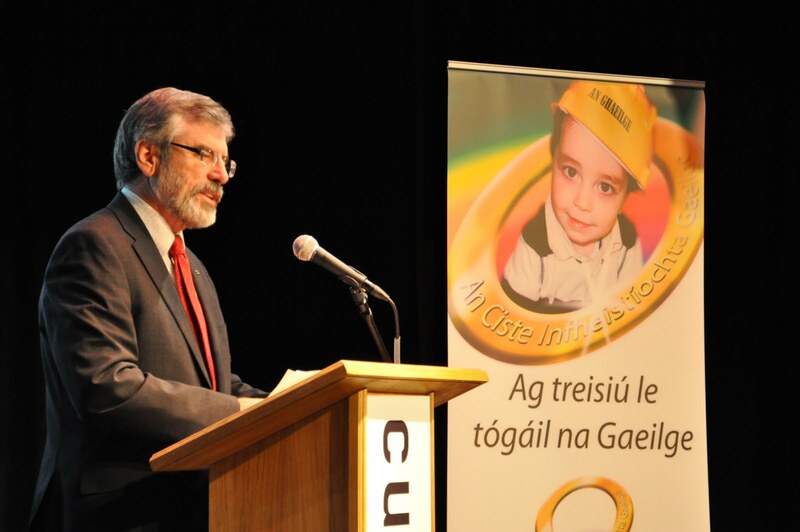 Regrettably, he has not honoured this commitment and the battle around that aspect of the Irish language continues. 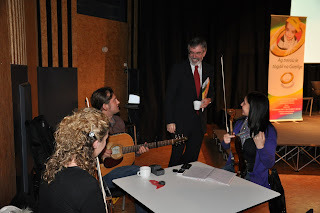 However, this blog secured a commitment for a £20 million funding package for the Irish language from Gordon Brown the British Prime Minister. £12 million went to the Irish Language Broadcast Fund for a further four years after 2011. And £8 million was provided for funding for Irish Language capital projects. As a result a new organisation - An Ciste Infheistíochta Gaeilge – was created to administer the distribution of the £8 million fund. Its focus is to work with Irish language organisations and explore ways in which Irish language capital infrastructure projects can be advanced. An Ciste is about stimulating economic development and job creation and to do so in partnership with other Irish language groups. 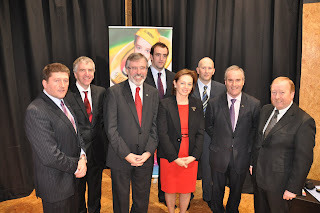 Its formal launch was last Wednesday morning in An Cultúrlann Uí Chanáin in Derry. The establishment of An Ciste is a vital step forward in the process of investing in and growing the Irish language across the north. And while this funding is very important and will make a huge contribution to the growth of the language, there remains much work to be done. Gaeilgeoirí have a big job before us to win support for the Irish language and culture from those who feel threatened by it. We have to persuade them that the gift of an indigenous language is a national treasure and the heritage of all who live on this island, no matter about political or other allegiances. 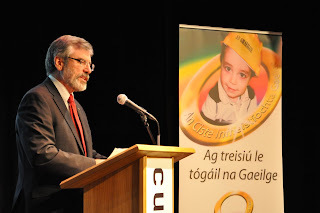 In the meantime Sinn Féin Ministers will continue to support and introduce gaeilge-friendly policies in their departments, including bi-lingual services and signage, and the DUP is in no doubt about our insistence that the Executive has to deliver for everyone, including Gaeilgeoirí. There has been progress. The Minister of Education Caitriona Ruane is doing pioneering work in Irish medium education. An Ghaelscolaíocht has been put on a more secure footing across the north as it continues to expand and develop. Millions of pounds of funding and capital investment have been secured for the sector. 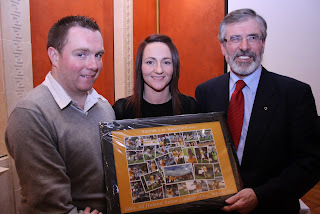 So, comhghairdeas to all involved with An Ciste and adh mór for the future. The following day it was an early start for Cork. The plane was tiny. No one was swinging a cat, or anything else in it. Cork was a hectic day of media interviews and meetings, including a briefing, and question and answer session with community, voluntary and trade union representatives in the city. 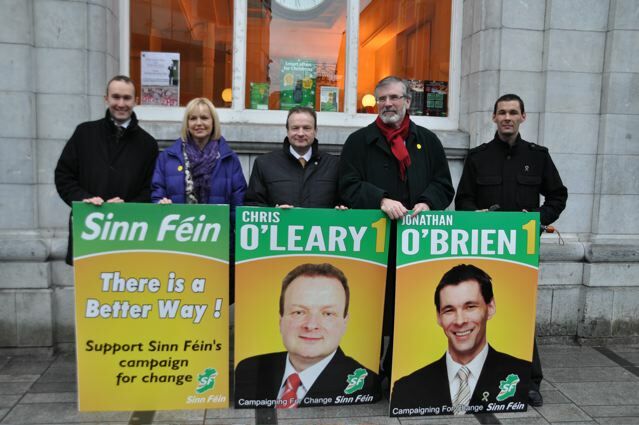 There is a good team of Sinn Féin candidates in the rebel county – Jonathan O Brien, Chris O Leary, Sandra McLellan and Paul Hayes and Des O Grady. And then it was back on that tiny plane and heading for Belfast. The weather forecast all day had been predicting snow and there was a concern that we might be diverted but as luck had it we arrived in Belfast City Airport as the first of the heavy snow was falling on the mountains below us. And finally a word of thanks to the Belfast National Graves who do tremendous work looking after republican monuments and graves in Belfast and remembering our fallen comrades. Last Monday morning they held an event in Parliament Buildings in Stormont to relaunch Patriot Graves, first published in 1985. The book, which sells for £6.99 tells the story of republican activism in Belfast since the 1790’s and remembers those of previous generations who battled for Irish freedom and sovereignty. It recalls all of those IRA Volunteers and Sinn Féin activists who died in Belfast from 1969 to 1984 and gives a little account of each. The second book which covers the later period will be republished for Easter. It is an excellent publication. And finally, finally. Well done also to Antrim’s Camogs. 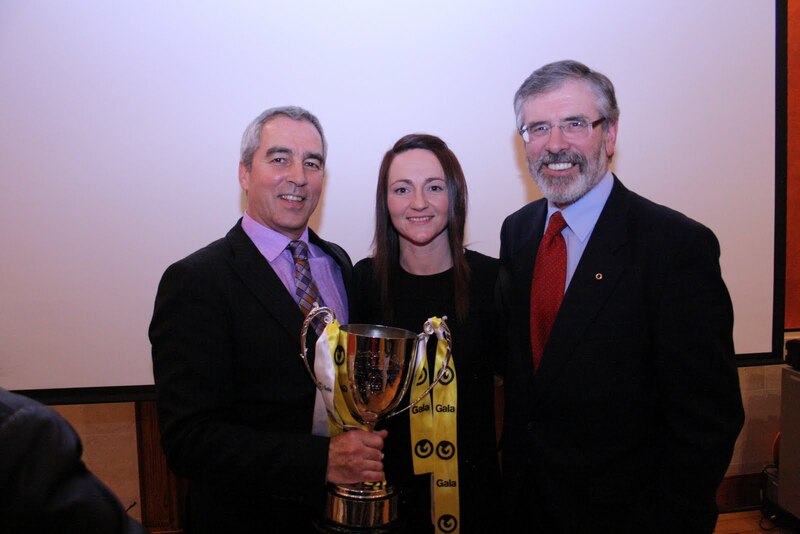 We had a great event in Stormont on Tuesday to celebrate our county teams’ achievements. This group of young women did us proud. The Belfast National Graves Association expects to have its own web site up and running shortly. Hello Gerry ,I recall the Hillsborough Castle event had some all nighters ,with you sleeping on the floor. The British government was not interested,they do have a short access of enthusiasm for Sinn Féin,in general. An Ciste Infheistíochta Gaeilge , looks very good. A word on Belfast National Graves, a national trust for historic preservation and treasure, and should be viewed as. 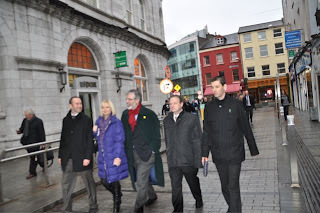 I look to see Sinn Féin growth in the South,and the work that could be done on other historic preservation. I was in Dublin last year, and saw The Mansion House( Teach an Ard-Mhéara)one can talk about unfinished business ,the preservation of this historic place is a National Disgrace. Dublin's historic Mansion House,is a central place in Irish republicanism. The historical-debates that took place , and now in such disrepair. I understand the money problems, but more has to be done, before 2016 on this. Your looking very well, this is a good time for Ireland, in many ways.